The original Pontchartrain Hotel only lasted 13 years, but it helped to foster the automotive industry. So these automotive pioneers and their associates moved over to Durant’s “commodious quarters” at the Pontchartrain Hotel. Although the merger of the Ford, Buick, Maxwell-Briscoe, and REO companies never worked out, the Pontchartrain became established as “the mother of motors,” according to George Stark, author of In Old Detroit. Its bar served as a laboratory where men demonstrated components and studied blueprints. Pontchartrain bartender Peter Drexelius even remembered when Albert Champion showed off his new porcelain spark plug to one and all. Construction of the Pontchartrain, on Cadillac Square at Woodward Avenue, began in the spring of 1906, with completion planned for a year later. The site was dedicated to hotels even before 1857, when the six-story Russell House emerged as one of Detroit’s principal establishments. The Prince of Wales, later to become King Edward VII, stayed there in 1859, and Russia’s Grand Duke Alexis followed in 1870. When the Russell House was knocked down to make way for the Pontchartrain, the property, owned by the estate of Dr. E.M. Clark, was worth $700,000. The Detroit News reported that Westinghouse, Church, Kerr & Co. used 125 men and 20 teams and wagons to excavate 18,000 cubic yards of earth. Construction costs, financed by heirs of the late Sen. James McMillan, totaled a cool $1 million. Architect George Mason planned a décor “richer than any similar building in the country,” The News said. Furnishings worth $300,000 filled the interior. Inside the glittering bar — sorry, men only — hung painter Kenneth Newell Avery’s 94-by-55-inch portrait of Louis Phélypeaux’s Count Pontchartrain, serving as a link to 1701 when Antoine de la Mothe Cadillac founded Fort Pontchartrain du Détroit. Besides auto magnates, the bar was important to politicians: Mayor Oscar Marx (1913-18) and councilmen drank there so frequently, it earned the nickname City Hall Annex. 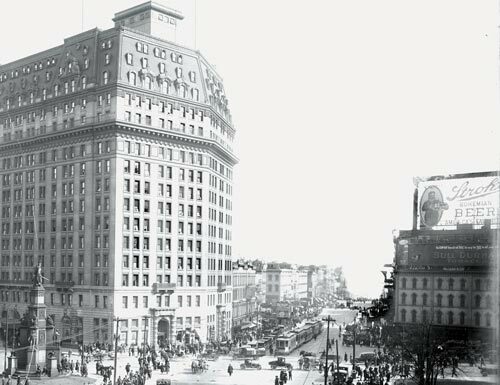 After a five-story expansion in 1909, the Pontchartrain offered nearly 400 rooms, but its attractive furnishings fell out of favor by 1915 due to the new “modern” Statler Hotel. Meanwhile, that April, the Detroit Athletic Club opened up at Madison and Randolph and became “the grand lodge of the automobile business,” as Malcolm W. Bingay put it.